TODAY´S THE DAY!!! Scare me Silly is finally open since 4 AM SLT :). I´m sorry that I only tell you about it now, but I´ve just come home after being out and about all day. 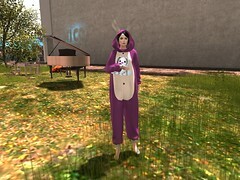 …and more in support of Team Diabetes of Second Life! And now you wanna know WHERE to get it?! – Well, right HERE . After all those previews I´ll blog more of the awesome items during the event´s duration so be curious.